Ramona El Hamzaoui arrived in New Delhi in July 2017 as the Deputy Mission Director, supporting the Mission Director in overseeing operations and programming. 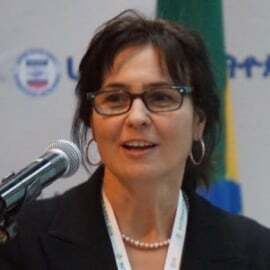 She was previously posted to Addis Ababa, Ethiopia where she also served as USAID Deputy Mission Director. Prior to Ethiopia, Ramona served four years in Dhaka, Bangladesh, where she managed several presidential initiatives under the economic development portfolio. Ramona has served with USAID for more than 16 years. This includes assignments as acting mission director for nine months and assistant director/program officer for more than three years in Rabat, Morocco and work as an agriculture officer for two years and democracy officer for three years in Bogota, Colombia focused on human rights, local governance and access to justice programs. programs and two years for a private environmental consulting firm in Vermont. Prior to that, she worked in the International Programs Office at the University of Maine. A native of New England, Ramona holds a Master’s Degree in wildlife conservation from the University of Maine where she concentrated on the economic valuation of natural resources. She speaks French, Spanish and Moroccan Arabic. She is part of a USAID tandem couple and they are the proud parents of two children - one in university and one in high school.